Comments: Margaretha Sophia Prien (Nee: ) | Heide Germany | c1890s | Comments: My Great Grandmother's Brother Peter Hinrich Friedich Prien geboren 15.4.1852 in Heidegestorben 1933 in Heide -----Margartha Sophia Prien geb.kohlssatgeboren21.1.1854 in Eddelakgestorben 1927 in Heid w Heirat am 30.8.1879 in Heide This is one of four photos submitted .To view the others click on the Email address below ..These include a Mystery Wedding of my 2nd great-aunt,Antje Marie Caroline PRIEN , 2 Different photos of couples that may be her parents.one was sent to me by a distant cousin that lived in the PRIEN family home. (the one with 3 young men..) . 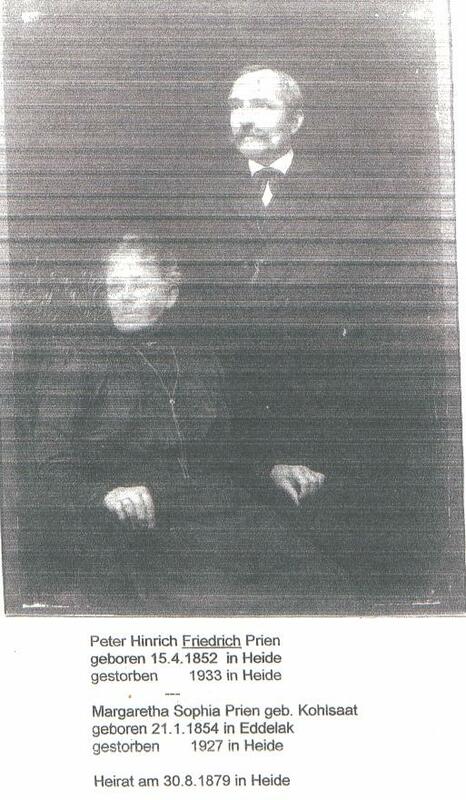 There is also a photo of one of the brothers of Antje Marie Caroline PRIEN and my great-grandmother,Bertha Catharine Margaretha PRIEN HARGENS .. Comparing his photo with the one of the three youngmen and his with their parents . there is a good chance that that he is the middle son , The eyes look similar.